Although this RC scope (AKA "The Unfinished Scope," because of its extremely long creation time) has been sold ($25,000, and cheap at twice the price), I thought the unique construction methods and features might be of interest to ATMs, etc. No I will not build another one - not ever again! Too much effort! This scope has build-quality and features that even God hasn't conceived (explained in depth below). Otherwise, why build it at all? 5 years in the creation and over 1000 hours of effort. This scope was originally designed and built to have conveniences and features that I have always desired in a personal scope, but could never find at any price. The scope's visual back (pictured above left) has the same large format threads as a 10" or larger Meade SCT (3.25"-16tpi) and fitted with a 2" format (you guessed it) VSI M4 focuser. For show, the focuser totes a Slider 2 with a CCD camera. 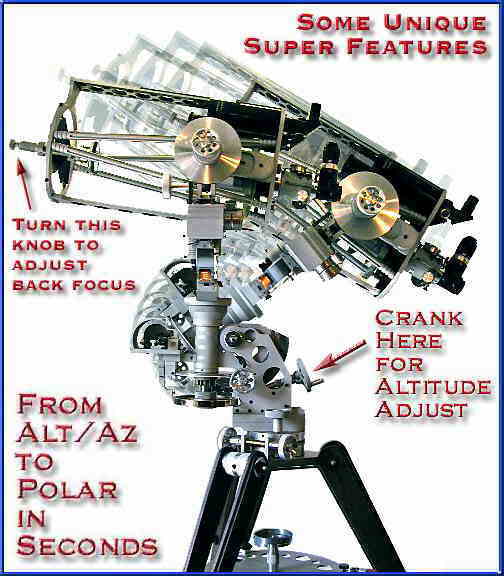 There are actually four scopes in one: the main 10.25" RC optics, a 3" refractor view finder, a 3" Maksutov guide scope, and a polar alignment scope (close-up picture above) which is conveniently mounted to one of the titanium fork arms which is parallel with the RA axis. I have created a time-lapse picture (directly above) to illustrate [what I consider to be] a super feature, the worm driven altitude adjust mechanism ("Look, no awkward wedge!"). Just loosen the lock-knob and turn the crank (see arrow above), which turns a brass worm and 1/4 section [tangent-type] worm gear. Originally, the altitude adjustment was not going to go all the way up to alt/az (or is that down? ), but with all the after-market alt/az computer controlled drive systems on the market, I thought this would give the scope another useful function. I thought long and hard on the drive system for this special scope. It could have been anything from simple synchronous motors for tracking only, to GO-TO computer control. I decided to go with the classic, super precision synchronous motor control on both axis with variable frequency generator control in RA. With adjustable friction clutches on the 7.5" Byers worm drives in both axis, you can simply slip the scope's clutches and manually move to various celestial objects, if you want, using the 8" diameter brass setting circles. When you let go of the scope, the drives automatically take over for tracking just like most of the commercial scopes on the market. This "tried & true" method saves wear and tear on those precision worm gears because you are not forced to slew your scope to another position by driving your encoder equipped motors, like the current generation of GO-TO SCTs (LX200s, Next Gen, etc.). If you slip the clutches with a GO-TO system, you're "lost in space" until you re-initialize your scope. Of course there are ways around this dilemma by simply attaching your encoders directly to the RA and Dec shafts of your scope (not as hi-res, but adequate for location puposes) instead of attaching the encoders to the armature shafts of its drive motors (I installed the former RA/Dec shaft system on my 30-inch Cassegrain at BFO using large diameter metal spur gears - no sloppy rubber cog pully drives). Precision micro-tracking for astroimaging is achieved by altering the line frequency (from 40 to 80Hz) in RA and activating the synchronous Dec motor for position correction. There is no periodic-error-correction (PEC) because it wasn't even a factor on my priorities list of "must-haves" for this scope. Explaining further, commercial SCTs need PEC because their worms are so inaccurate that PEC is a necessity. Byers made the finest worm drives, period. They are a literal factor of ten better because he used ultra-precision machining equipment that is designed to provide an accuracy of 0.0001" where all the commercial [mediocre] drives are manufactured on machines with accuracies of only 0.001" where 0.003" is the norm. Auto guiding can easily correct for all your other tracking errors, including PEC. Worm excentricities are the least of your concerns compared to low altitude refraction of the Earth's atmosphere, turbulence (seeing), polar alignment errors, mount axis errors, lateral image shift and optical axis misalignments. You will always have to correct for a myriad of undesirable tracking factors, PEC being one of the lesser concerns on a scope with hi-accuracy worms, like this one. As an after thought, I also installed faster, variable speed DC servo motors in both RA and Dec to provide fast and convenient centering of celestial objects in your field of view for visual observing. The full-featured hand paddle has 10 push buttons in all. Just push any of the inner four push buttons for slow synchronous motor control in RA and Dec, or push any of the outer four push buttons for fast DC servo motor control. And two more push buttons for focuser IN/OUT motor control. There are also five [motor speed] control knobs on the hand paddle; a ten-turn control knob (pot) for very fine variable frequency control, two knobs for RA and Dec DC servo motor speed control, and two knobs for IN/OUT focuser motor speed control. Since there is a universal drive train on each axis, with plenty of room for additional drive systems, you can easily upgrade as more sophisticated drive systems become available as an after-market add-on, if you want. The philosophy behind choosing this classic simple drive system was to follow through with a single-minded concept of precision, not perfection. Synchronous motors are still beyond all others for tracking accuracy. The idea here is functionality, timeless design, and build-quality beyond any other scope. This is not a telescope, it is the epitomy of precision metal art that will be immediately worth many times its purchase price (because I only asked a small fraction of the actual value considering the time and effort I have into this creation) and appreciate in value over the decades. This scope will not wear out and fall apart like all the mass-produced [made in China] commercial scopes of today with their Nylon bearings, thin-wall pot-metal castings, sheet-metal construction and plastic parts. 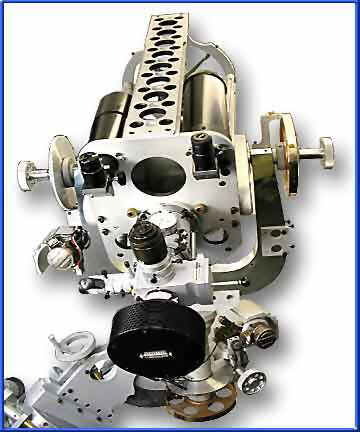 By the way, if you don't know a lot about optics, the Ritchey-Chretien (RC) optical system (hyperbolic-hyperbolic) was chosen because it is simply the finest optical configuration out of the myriad of possible Cassegrain optical configurations (i.e. 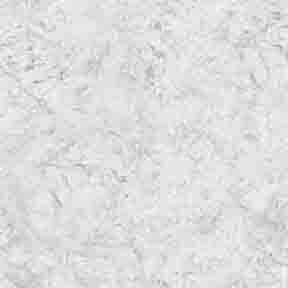 Classical, Schmidt, Maksutov, Dall-Kirkham, etc.) This is why all, I repeat all, the large observatory scopes are RC configurations. 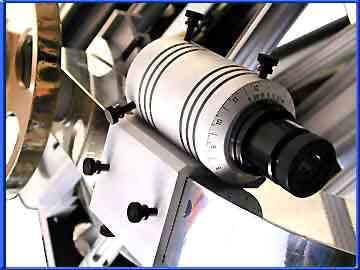 The stars, observed through this scope, are tight micro-diamonds, always with double diffraction rings, and the backgrounds are absolute velvet black on black. Optically, it doesn't get any better than that. I don't know how you can get 'ideal refractor-quality' imaging with an RCs giant secondary center obstruction, but seeing is believing, and believe me, it works! I've been looking through scopes for over 40 years, every configuration possible and some that were said to be impossible, and there is nothing better than an RC. Even a quality APO refractor pales by comparison. 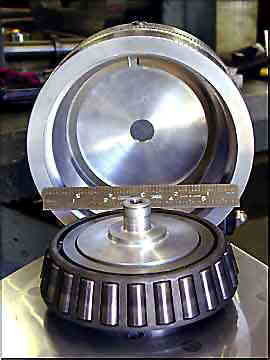 ABOVE LEFT: The gigantic 6-inch diameter tapered-race roller bearing in the base of the azimuth axis. 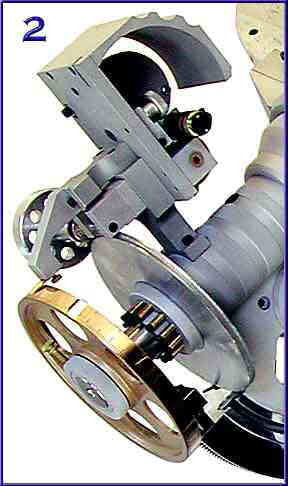 ABOVE RIGHT: The dual rows of needle thrust bearings in the upper head of the right ascension (RA) axis, providing additional lateral support to the titanium fork (not shown are the ultra-precision, class 7, dual radial ball bearings supporting the 1.75" diameter, solid stainless steel RA shaft). The altitude and azimuth axis' are both worm gear driven, a feature not found on any other scope on planet Earth (at least not to my knowledge). 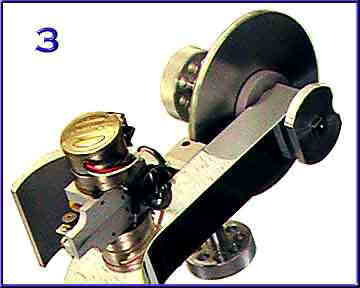 Note the double ended knobs on the brass worm in the lower foreground (better shown in close-up picture #1 below) that control azimuth position. Azimuth [compass] degrees are also engraved on the drum that holds the 6-inch diameter tapered race roller bearing (shown in left picture at top of page). 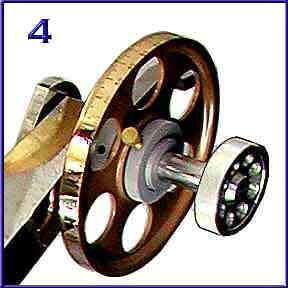 The vertical knob above the brass azimuth worm locks the azimuth axis. The altitude axis is a quarter-section worm gear (see blue arrow, picture #1 below) with a long brass worm that's controlled by the large angled hand knob (spinner handle) at the rear of the mount. By simply cranking this knob, you can adjust the altitude from 90 degrees (that's right, you can operate this scope in the ALT/AZ mode, or at the north or south pole - how frigid is that) to around 15 degrees of altitude (not shown, on the other side of the quarter-section worm gear are engraved increments of elevation in degrees). In other words, you can go from ALT/AZ to POLAR with the turn of a crank, without ever having to realign your mount. There's also an altitude axis lock knob, it's the one at the center of the main mount which locks this axis via a machined, circular cut T-slot. 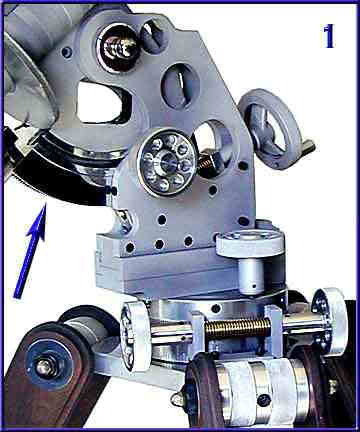 This altitude axis has double ball bearings located behind the shinny ball knob covers in the upper part of the frame on image #1 below. Note the dovetail just above the azimuth drum for easy dismantling of the main RA mount assembly from the lower tripod. The titanium fork is also dovetailed (not shown) to disassemble from the RA head, which also provides right-to-left balancing by off-centering the dovetailed fork (two of the directional movements of the unique 6-way weightless balancing system mentioned earlier). 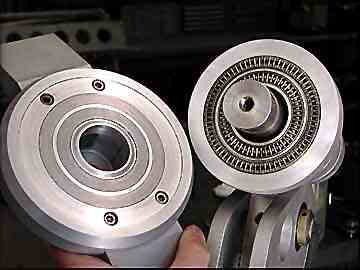 The RA axis has a 1.75" diameter stainless steel shaft set in dual ball bearings and dual rows of thrust bearings (shown in right picture at top of page). Adjustable friction clutches are on the 7.5" Byers drive gear and the 8" diameter brass RA setting circle. Both brass circles are sealed in marine-grade lacquer so they won't tarnish. The other fork arm of the Dec axis has an matched 8" diameter brass setting circle with locking slip-clutch. Note the large knobs on the end of each fork arm. These knobs lock the tube assembly in place [again] using T-slots in the adjustable arms on the side of the truss-tube assembly. It also provides easy front-to-rear slide movement of the tube assembly for weightless balance control. The crutch-style tripod is solid black walnut and stressed into a crutch-type configuration. 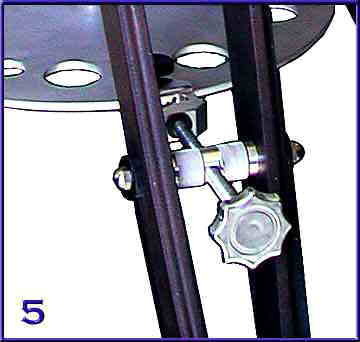 The tripod knob noted in picture #5 below is one of three knobs (pictured above) used to horizontally micro-level the tripod. Just turn one of the knobs and the attached crutch leg moves in or out depending on which way you turn the knob. The large flat plate between the tripod legs is bored around the perimeter to hold many 1.25" and 2" format eyepieces and accessories very securely. The crutch feet have wheels with dual-axis locking mechanisms, but will also have (4-inch square) plate feet that instantly slip over the wheels for rock-solid stability. This new picture is the [just completed] control box, housing the electronics for the variable frequency generator (VFG) that controls the two RA synchronous motors, three variable DC power supplies to control the speed of the three DC servo motors (i.e. RA, Dec, and focus) and the relay banks to control the overall operation of all the motors from the hand paddle. On the front of the control box, you see the power switch (on the right) and the neon light just above, which indicates frequency (from 40 to 80Hz) by blinking at various rates. The switch at the left labeled HEMI is for reversing the tracking direction for either the northern or southern HEMIspheres. You never know when you might want to see a southern eclipse. The two DB9s are where you plug in the RA & Dec motor control (using a standard double-ended DB9 connector cable) harnesses and the DB25 in the center is the control plug for the hand paddle shown on top of the control box. 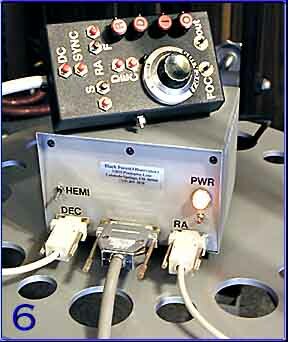 The rear of the control box (not shown) has a 120vac (standard computer cord) plug input, a 12vdc battery input (with cigarette lighter cord and plug) for remote operation, a fused case socket for the 12vdc battery power, and a pair of "3055" power transistors mounted (with TO-5 sockets) to the back using the aluminum case as a heat sink. The black hand paddle (HP) is loaded with fun control goodies. The large 10-turn control knob (with rotation indicator window) is used to change the tracking rate of the VFG, and the small lock-nut pot on the lower side of the HP case is for calibration of that tracking rate. The other 4 knobs, with the red tops, are (from left to right) RA DC servo motor speed control, Dec DC servo motor speed control, focuser IN speed control and focuser OUT speed control. The dual IN/OUT speed control system is an exclusive mechanical/electronic convenience that is installed on all VSI motorized Monster focuser housings and hand paddles called a Zenith-Lift system. Since this scope totes a Monster 4, which has the mechanical zenith-lift springs on either side of the focuser housing, I also incorporated the electronic part of the Zenith-Lift system into the hand paddle (an obvious "no-brainer" decision). About the push-buttons (PB), the two PBs at the bottom right are the focuser IN-OUT PBs. The inner row of 4 buttons, on the top left, are for controlling RA and Dec via the Hurst synchronous motors. This very slow rate of speed is excellent for micro-corrections involving astroimaging. The outer row of 4 buttons controls the much faster RA and Dec DC servo motors. The faster system is for casual sky observing, fast centering of celestial objects in your field of view with relatively lower power eyepieces, and for people (without patience like me) who want to Messier marathon (no GO-TO systems allowed) all the time. FYI, many of the mechanical and motor drive train logistics, during the term of this 5-year project, have been re-designed, re-machined or re-built, up to four times, until I was satisfied with the design and performance.